Less than a week remains on the countdown! Giving credit where it is certainly due, today’s Dev Blog update looks at the talent behind the art direction and animation of S2HD. We’d like to post up questions on the blog that the project’s followers here on Retro have for individual staff members as well, so sound off in the comments! When the voice of Sonic the Hedgehog speaks, millions listen. Except those who are waiting for Martin Burke to make his triumphant return. This amazing footage was taken by Retro’s own Skyler “Moonshadow Ben Kalough Catz” King, on assignment at SacAnime, in beautiful Sacramento, California! Among the many guest who showed up was Sega’s own Roger Craig Smith, the current voice of the blue blur. 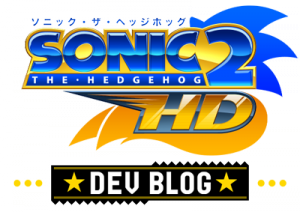 Apparently nice enough to deal with Sonic the Hedgehog fans (or at least hasn’t fully come to terms with what he’s gotten into) he offered his well wishes to not only Moonshadow, but the only Sonic site second to Sega. What site could that be? Protip: It starts with the letter “S.” Playing favorites? I certainly hope so. I really need to get around to checking out those consoles.